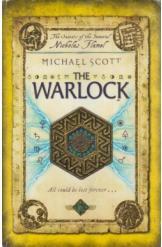 The Warlock by Michael Scott, Sci Fi. Book is in good condition, all pages intact. Josh has betrayed his sister Sophie, and joined the Dark Elders in their mission to destroy the world. The twins' struggle bring them across fantastical reams filled with strange creatures and deadly powers. Book five of "The Secrets of the Immortal Nicholas Flamel" series.